Explain gravitational potential energy in terms of work done against gravity. Show how knowledge of the potential energy as a function of position can be used to simplify calculations and explain physical phenomena. Climbing stairs and lifting objects is work in both the scientific and everyday sense—it is work done against the gravitational force. When there is work, there is a transformation of energy. The work done against the gravitational force goes into an important form of stored energy that we will explore in this section. Let us calculate the work done in lifting an object of mass through a height such as in Figure 1. If the object is lifted straight up at constant speed, then the force needed to lift it is equal to its weight The work done on the mass is then We define this to be the gravitational potential energy put into (or gained by) the object-Earth system. This energy is associated with the state of separation between two objects that attract each other by the gravitational force. For convenience, we refer to this as the gained by the object, recognizing that this is energy stored in the gravitational field of Earth. Why do we use the word “system”? Potential energy is a property of a system rather than of a single object—due to its physical position. An object’s gravitational potential is due to its position relative to the surroundings within the Earth-object system. The force applied to the object is an external force, from outside the system. When it does positive work it increases the gravitational potential energy of the system. Because gravitational potential energy depends on relative position, we need a reference level at which to set the potential energy equal to 0. We usually choose this point to be Earth’s surface, but this point is arbitrary; what is important is the difference in gravitational potential energy, because this difference is what relates to the work done. The difference in gravitational potential energy of an object (in the Earth-object system) between two rungs of a ladder will be the same for the first two rungs as for the last two rungs. Gravitational potential energy may be converted to other forms of energy, such as kinetic energy. If we release the mass, gravitational force will do an amount of work equal to on it, thereby increasing its kinetic energy by that same amount (by the work-energy theorem). We will find it more useful to consider just the conversion of to without explicitly considering the intermediate step of work. (See Example 2.) This shortcut makes it is easier to solve problems using energy (if possible) rather than explicitly using forces. Figure 1. (a) The work done to lift the weight is stored in the mass-Earth system as gravitational potential energy. 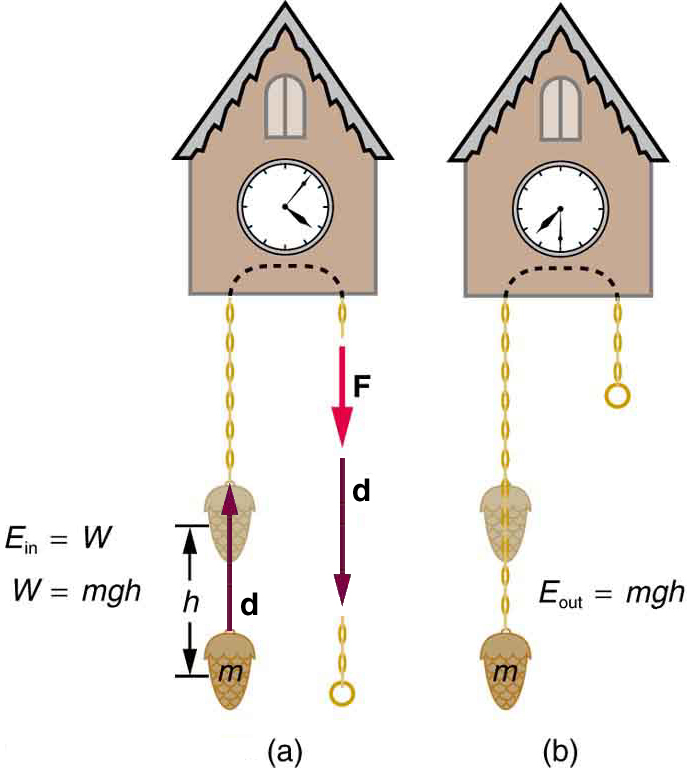 (b) As the weight moves downward, this gravitational potential energy is transferred to the cuckoo clock. Note that the units of gravitational potential energy turn out to be joules, the same as for work and other forms of energy. As the clock runs, the mass is lowered. We can think of the mass as gradually giving up its 4.90 J of gravitational potential energy, without directly considering the force of gravity that does the work. The equation applies for any path that has a change in height of not just when the mass is lifted straight up. (See Figure 2.) It is much easier to calculate (a simple multiplication) than it is to calculate the work done along a complicated path. The idea of gravitational potential energy has the double advantage that it is very broadly applicable and it makes calculations easier. From now on, we will consider that any change in vertical position of a mass is accompanied by a change in gravitational potential energy and we will avoid the equivalent but more difficult task of calculating work done by or against the gravitational force. Figure 2. The change in gravitational potential energy (ΔPEg) between points A and B is independent of the path. ΔPEg=mgh for any path between the two points. Gravity is one of a small class of forces where the work done by or against the force depends only on the starting and ending points, not on the path between them. A 60.0-kg person jumps onto the floor from a height of 3.00 m. If he lands stiffly (with his knee joints compressing by 0.500 cm), calculate the force on the knee joints. This person’s energy is brought to zero in this situation by the work done on him by the floor as he stops. The initial is transformed into as he falls. The work done by the floor reduces this kinetic energy to zero. with a minus sign because the displacement while stopping and the force from floor are in opposite directions The floor removes energy from the system, so it does negative work. The distance that the person’s knees bend is much smaller than the height of the fall, so the additional change in gravitational potential energy during the knee bend is ignored. (a) What is the final speed of the roller coaster shown in Figure 4 if it starts from rest at the top of the 20.0 m hill and work done by frictional forces is negligible? (b) What is its final speed (again assuming negligible friction) if its initial speed is 5.00 m/s? Figure 4. The speed of a roller coaster increases as gravity pulls it downhill and is greatest at its lowest point. Viewed in terms of energy, the roller-coaster-Earth system’s gravitational potential energy is converted to kinetic energy. If work done by friction is negligible, all ΔPEg is converted to KE. The roller coaster loses potential energy as it goes downhill. We neglect friction, so that the remaining force exerted by the track is the normal force, which is perpendicular to the direction of motion and does no work. The net work on the roller coaster is then done by gravity alone. 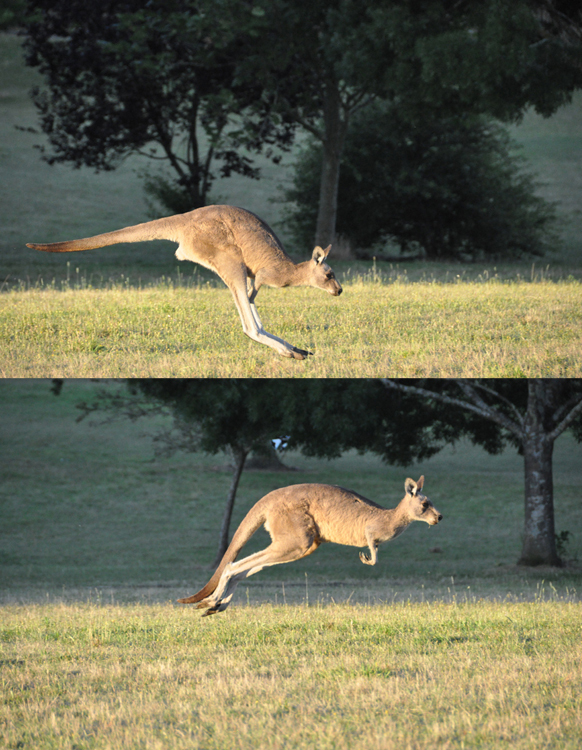 The loss of gravitational potential energy from moving downward through a distance equals the gain in kinetic energy. This can be written in equation form as Using the equations for and we can solve for the final speed which is the desired quantity. First, note that mass cancels. This is quite consistent with observations made in Chapter 2.7 Falling Objects that all objects fall at the same rate if friction is negligible. Second, only the speed of the roller coaster is considered; there is no information about its direction at any point. This reveals another general truth. When friction is negligible, the speed of a falling body depends only on its initial speed and height, and not on its mass or the path taken. For example, the roller coaster will have the same final speed whether it falls 20.0 m straight down or takes a more complicated path like the one in the figure. Third, and perhaps unexpectedly, the final speed in part (b) is greater than in part (a), but by far less than 5.00 m/s. Finally, note that speed can be found at any height along the way by simply using the appropriate value of at the point of interest. We have seen that work done by or against the gravitational force depends only on the starting and ending points, and not on the path between, allowing us to define the simplifying concept of gravitational potential energy. We can do the same thing for a few other forces, and we will see that this leads to a formal definition of the law of conservation of energy. One can study the conversion of gravitational potential energy into kinetic energy in this experiment. On a smooth, level surface, use a ruler of the kind that has a groove running along its length and a book to make an incline (see Figure 5). Place a marble at the 10-cm position on the ruler and let it roll down the ruler. When it hits the level surface, measure the time it takes to roll one meter. Now place the marble at the 20-cm and the 30-cm positions and again measure the times it takes to roll 1 m on the level surface. Find the velocity of the marble on the level surface for all three positions. Plot velocity squared versus the distance traveled by the marble. What is the shape of each plot? If the shape is a straight line, the plot shows that the marble’s kinetic energy at the bottom is proportional to its potential energy at the release point. Figure 5. A marble rolls down a ruler, and its speed on the level surface is measured. Work done against gravity in lifting an object becomes potential energy of the object-Earth system. The change in gravitational potential energy, is with being the increase in height and the acceleration due to gravity. The gravitational potential energy of an object near Earth’s surface is due to its position in the mass-Earth system. Only differences in gravitational potential energy, have physical significance. 1: In Example 2, we calculated the final speed of a roller coaster that descended 20 m in height and had an initial speed of 5 m/s downhill. Suppose the roller coaster had had an initial speed of 5 m/s uphill instead, and it coasted uphill, stopped, and then rolled back down to a final point 20 m below the start. We would find in that case that it had the same final speed. Explain in terms of conservation of energy. 2: Does the work you do on a book when you lift it onto a shelf depend on the path taken? On the time taken? On the height of the shelf? On the mass of the book? 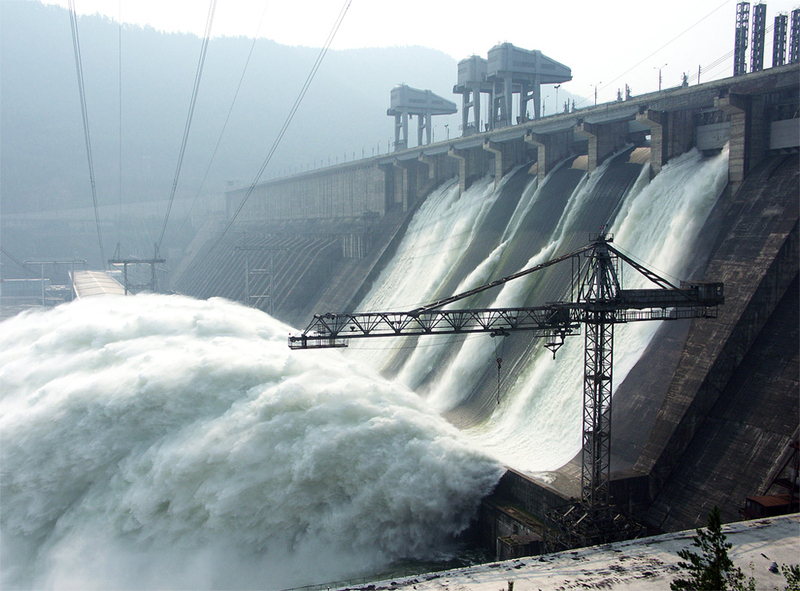 1: A hydroelectric power facility (see Figure 6) converts the gravitational potential energy of water behind a dam to electric energy. (a) What is the gravitational potential energy relative to the generators of a lake of volume given that the lake has an average height of 40.0 m above the generators? (b) Compare this with the energy stored in a 9-megaton fusion bomb. 2: (a) How much gravitational potential energy (relative to the ground on which it is built) is stored in the Great Pyramid of Cheops, given that its mass is about and its center of mass is 36.5 m above the surrounding ground? (b) How does this energy compare with the daily food intake of a person? 3: Suppose a 350-g kookaburra (a large kingfisher bird) picks up a 75-g snake and raises it 2.5 m from the ground to a branch. (a) How much work did the bird do on the snake? (b) How much work did it do to raise its own center of mass to the branch? 5: A 100-g toy car is propelled by a compressed spring that starts it moving. The car follows the curved track in Figure 7. 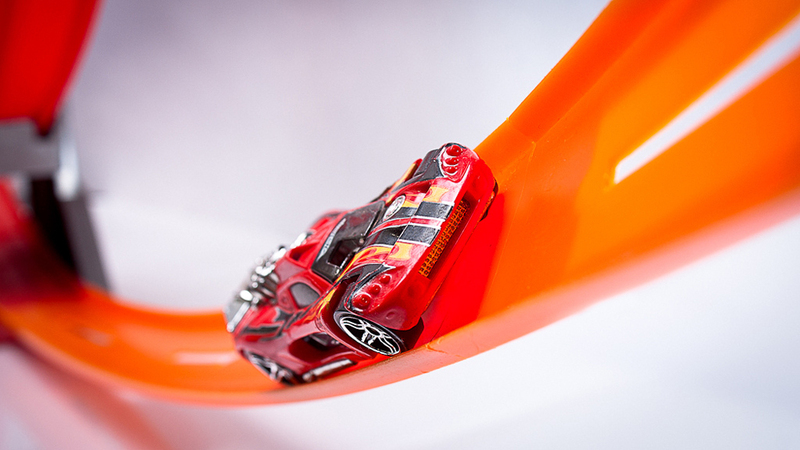 Show that the final speed of the toy car is 0.687 m/s if its initial speed is 2.00 m/s and it coasts up the frictionless slope, gaining 0.180 m in altitude. 6: In a downhill ski race, surprisingly, little advantage is gained by getting a running start. (This is because the initial kinetic energy is small compared with the gain in gravitational potential energy on even small hills.) To demonstrate this, find the final speed and the time taken for a skier who skies 70.0 m along a slope neglecting friction: (a) Starting from rest. (b) Starting with an initial speed of 2.50 m/s. (c) Does the answer surprise you? Discuss why it is still advantageous to get a running start in very competitive events. (b) The ratio of gravitational potential energy in the lake to the energy stored in the bomb is 0.52. That is, the energy stored in the lake is approximately half that in a 9-megaton fusion bomb. 7.3 Gravitational Potential Energy by OpenStax is licensed under a Creative Commons Attribution 4.0 International License, except where otherwise noted.